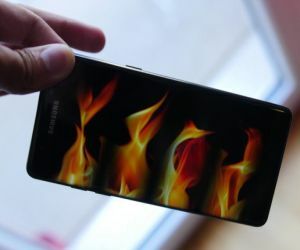 Samsung has recalled all 2.5 million Galaxy Note 7 phones it has sold due to a risk their batteries may catch fire or explode. "On average, your apps will run about 15 percent slower in the summer!" reads a report issued by Apteligent, maker of tools for mobile app developers. They say that's because humidity weakens radio signals and causes delays as lost data must be retransmitted. A Houston man spilled some solvent on his pants. He went outside to let the sun evaporate it just as a Google Maps car drove by, and immortalized the embarrassing moment. The popular Whatsapp messaging app, now owned by Facebook, will soon begin sharing users' data with its parent company. Users can opt out, but there's a deadline for doing so. Trend Micro has released some free tools that will help decrypt files encrypted by some ransomware programs without paying the hostage-takers. Visitors to NYC's Bryant Park will soon be tracked by their cellphone signals, and the aggregated, anonymized data (which includes the movement and buying habits of parkgoers) will be sold to marketers by the private group that manages the city-owned park. Twenty years of genetic research data has been wrong, thanks to the way many spreadsheet programs handle ambiguous data input. Gene names such as SEPT2 (which means "Septin 2" to geneticists) are convered to dates, i. e., "2-Sep." The discoverers of this glitch say, "there is no way to permanently deactivate automatic conversion to dates in MS Excel and other spreadsheet software such as LibreOffice Calc." But Google Sheets does not make this mistake. The world's largest battery can keep the lights on in Fairbanks, Alaska, for up to seven hours in the event of a power failure. Larger than a football field and weighing 1,500 tons, the city's new Battery Energy Storage System (BESS) consists of 13,760 individual nickel-cadmium cells, each the size of a desktop PC and weighing 165 pounds. A much smaller battery, which powers the Oxford Electric Bell has been going strong for 176 years. Nobody knows exactly what's inside the world's longest lasting battery, or how long it will last. More than 100 identity thieves were arrested and 900 investigations are now open thanks to an upgrade of the facial recognition system used by the New York Dept. of Motor Vehicles. The system can now compare 128 points on each driver's license photo instead of 64. Up to 56% of email recipients and 40% of Facebook users will click on a link from an unknown source even though they know the risk of being infected by malware, according to a study by the Computer Science department of FAU, a German university. Accused of liberal bias in the selection of "trending" news, Facebook fired all of its human editors and created an algorithm that does the job. The algorithm promptly started "trending" (giving priority to) fake news stories. It's so much easier to blame bias on poorly-written software. The Iranian government is building its own, tightly-controlled Internet, which is being touted as providing "high quality, high speed" connections at "low costs." Easy enough when you cut out international news, social media such as Twitter and Facebook, dissenting voices, and cat videos. The FBI has issued alerts to county election officials, warning them to be on the lookout for voting system hackers. Not that county election officials have the money or talent to do anything about hackers. Microsoft issued a red-faced apology after its Bing search engine was discovered mis-translating the Arabic word, "Daesh," used as a synonym for the terrorist Islamic State, as "Saudi Arabia." Maybe they just followed the money. An Iowa woman apparently hasn't read any of the numerous advisories warning consumers that the IRS does not demand payment of taxes in the form of gift cards. She lost nearly $6,000 to this well-publicised scam. Thousands of patent examiners cheated taxpayers out of $18.3 million by billing the Patent Office for nearly 300,000 hours of work they never did, according to a General Accounting Office audit. That's 2% of all billed hours between 2010 and 2014, but the Patent Office says that's a big improvement over previous years. Meanwhile, 500,000 patent applications are awaiting examination. Most recent comments on "Geekly Update - 08 September 2016"
"there is no way to permanently deactivate automatic conversion to dates in MS Excel and other spreadsheet software such as LibreOffice Calc." - I'm a little confused on this one: changing the data to date format is the default, but you certainly can deactivate this – either manually while entering data (by changing the format for either the individual cell, or for the entire sheet at once), when you copy & paste (as unformatted text, don't “detect special numbers”), or import from a .csv file (where it is already properly formatted). The article didn't really say exactly how they were using the program, but I find it very difficult to believe that this isn't a solvable problem (I use LibreOffice – I assume that Excel would work the same, but I haven't tested it). Yeah, Roger, our Chief Executive Muslim Terrorist never misses a chance to do something to destroy this country. What a dork! I used to live in Iowa, so I quickly read the story about the woman who got caught up in the IRS scam. Turns out she is from Idaho. No potatoes in Iowa. I've seen a number of remarks like yours. I've always wondered: On what do you base your comments about Obama? Absent evidence, you're making an accusation that has no basis in reality. That's dishonest. It also says more about you than about the President. Roger said: "Nothing like paying your Iranian competitors with your own money to build network to "attack" us back! Thanks Obama"
Jim Robbins said: "Yeah, Roger, our Chief Executive Muslim Terrorist never misses a chance to do something to destroy this country. What a dork!" Is Bob using the Facebook algorithm to vet these comments now? I can see no other explanation for allowing Roger and Jim Robbins' comments. If I was the CEO of Google I'd have to merge with Uber just for the humorous publicity Goober would get. I agree with HowardL and Kenneth Heikkila. Keep responder's comments to responses limited to the subjects of the columns. Personal attacks and snide political comments, from anyone of any and all political or religious bents need to be deleted, as a matter of course. We readers of this posting don't need to see this column start sinking to the bottom with ignorant, hate-filled and off-topic cat calls, comments and diatribes, as have so many other internet mailings. There are enough other websites such posters can vent their spleens. Keep "Ask Bob Rankin" a forum for and about current technology, and not one for the expression of personal vendettas and needless rants. The World's longest lasting battery's secret is revealed in the book, A HISTORY OF MAGIC. Since the book is only available to the Wizarding World and not to Muggles, I guess the rest of the World will have to wait until it dies. "Trend Micro has released some free tools that ..."
Thank you for finding this, and for passing it on. The article says the Fairbanks battery array can keep the power going for seven MINUTES, not hours! A friend who is something of an expert on this sort of stuff that I sent your description to indignantly pointed out the impossibility of the Fairbanks system providing seven hours worth, causing me to double check, and sure enough, he was correct! Conversion to Dates: The worst part about this behavior is that the original data gets converted to a Julian-based number, and you LOOSE the original data (regardless of the source; i.e., manual entry, CVS file, etc.). In the case of manual entry, you can re-enter the value once you notice it, but for external files you have to essentially TELL the spreadsheet that the column is ALPHA-only and NOT numeric (much like setting the Format for the cell/column). An aggravation, no matter what. "You don't need a weatherman to know which way the wind blows." In Jim's defense, $400,000,000 was given to Iran as a hostage payment. If Google and Uber did merge, it would lead to an era of Goober Peace. You must have previously considered (at one time or another) to blog using the likes of WordPress. I wonder what your reasons would be to not do so! Your weekly Geekly Update is very informative and may serve a larger audience, via a blog! It would not matter to me, since I would not miss reading them either way! Cheers! EDITOR'S NOTE: I don't understand. AskBobRankin.com has been a blog since 2005. A blog uses a content management system to publish articles, and produces an RSS feed. I use MoveableType (instead of WordPress) for that purpose.